As stated in an earlier blog, I always place all remains from my deer and turkey harvest back into nature. I can not casually throw these parts into a dumpster or garbage can. This tradition of mine proves a lot more work and time for me, but I feel this act is part of the respect for the animal I have mentioned in a past blog…nothing wasted! Everything returns back to the natural world. The parts I place out in the wilds are consumed by predators such as foxes and coyotes to many specie of bird life. Crows, chickadees, woodpeckers, the tufted titmouse, nuthatches and a host of other birds are helped to survive brutal winters by eating the muscle and fat tissue supplied by these parts. Like I said, these all return to nature. 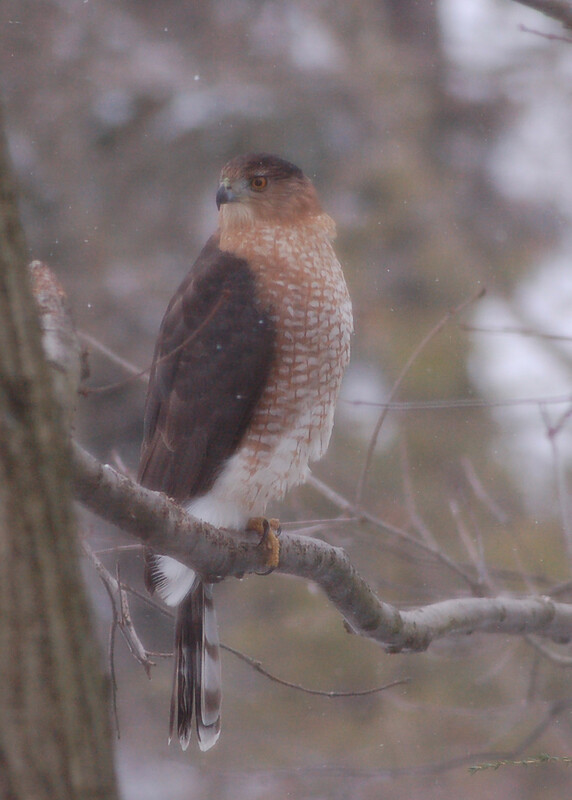 I often see the Cooper’s hawk on my property. These fast-fliers take an occasional bird to eat. Although, I do not wish this to happen, I realize the hawk has to kill to eat… a fact of nature! Whenever, A hawk sighting occurs on the property the area seems 100% void of bird life. They are hiding motionless among the many limbs of the vegetation I have planted. Sooner or later the hawk flies away and seemingly in an instance the feeders are filled again with activity.